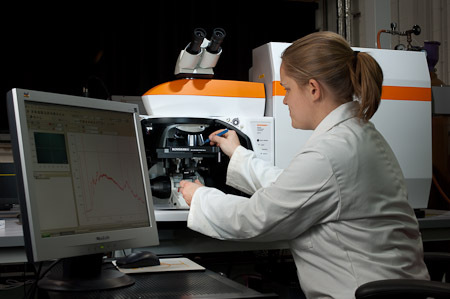 We use a variety of optical spectroscopic techniques to study defects or impurities in solids via the absorption, emission, or scattering of electromagnetic radiation. The interaction of radiation with matter can cause redirection of the radiation and/or transitions between the energy levels of the defects. A transition from a lower level to a higher level with transfer of energy from the radiation field to the defect this is called absorption. A transition from a higher level to a lower level is called emission if energy is transferred to the radiation field or nonradiative decay if no radiation is emitted. Redirection of light due to its interaction with matter is called scattering, and may or may not occur with transfer of energy, i.e., the scattered radiation has a slightly different or the same wavelength. When optical spectroscopic techniques are combined with an external perturbation (e.g. applied stress) much more information can be revealed about the symmetry and electronic structure of the system under investigation.